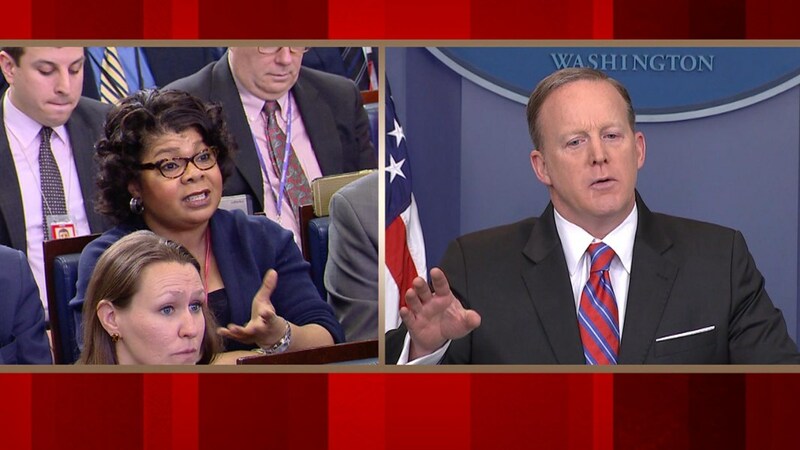 American Urban Radio Networks correspondent April Ryan, who was told by White House press secretary Sean Spicer to "stop shaking your head" during a Tuesday briefing, said she was shocked by the public response to incident. Ryan became the target of Spicer's ire on Tuesday after she pushed the press secretary on ongoing questions about federal investigations into the Trump campaign's ties to Russia. As Ryan mentioned on CNN, Clinton brought up Spicer's comments to Ryan at a major speech Tuesday night, using the episode as an example of ongoing sexism. Spicer's remarks drew backlash, with some critics accusing the press secretary of racist and sexist behavior. Spicer dismissed the accusations against him, telling conservative radio host Hugh Hewitt on Wednesday morning that attributing his comments to racism or sexism were "demeaning" to Ryan. At Spicer's Wednesday press briefing, Ryan was given the first question after an apparently friendly exchange with the press secretary. She called the exchange and Spicer's gesture to give her the first question of the briefing a "reset." Ryan did not directly accuse Spicer of sexism but called Washington a "male-dominated town."